Not to be confused with Devi-Bhagavata Purana or Bhagavad Gita. Bhagavata Purana manuscripts from 16th- to 19th-century, in Sanskrit (above) and in Bengali language. Bhagavata Purana (Devanagari: भागवतपुराण; Bhāgavata Purāṇa) also known as Śrīmad Bhāgavata Mahā Purāṇa, Śrīmad Bhāgavatam or Bhāgavata, is one of Hinduism's eighteen great Puranas (Mahapuranas, great histories). Composed in Sanskrit and available in almost all major Indian languages, it promotes bhakti (devotion) to Krishna integrating themes from the Advaita (monism) philosophy and from the Dvaita (dualism) philosophy. Sri Shukacharya narrated Śrīmad Bhāgavatam for seven days to Parakshit Raja on the banks of Ganga and present Haridwar. Gokarna organized and narrated Śrīmad Bhāgavatam for seven days on the banks of river Tungabhadra. Narada Rishi organized Śrīmad Bhāgavatam for seven days at Ananda on the banks of Ganga wherein Sanatkumara narrated. Sri Sutacharya who was present during the first narration of Sri Shukacharya to Parakshit Raja narrated Śrīmad Bhāgavatam to Sri Saunaka Rishi in Naimisaranya in an elaborate way and for a long period of time. The Bhagavata Purana discusses a wide range of topics including Cosmology, Genealogy, Geography, Mythology, Legend, Music, Dance, Yoga and Culture. As it begins, the forces of evil have won a war between the benevolent devas (deities) and evil asuras (demons) and now rule the universe. Truth re-emerges as Krishna, (called "Hari" and "Vasudeva (another name for Krishna)" in the text) – first makes peace with the demons, understands them and then creatively defeats them, bringing back hope, justice, freedom and happiness – a cyclic theme that appears in many legends. The Bhagavata Purana is a revered text in Vaishnavism, a Hindu tradition that reveres Vishnu. The text presents a form of religion (dharma) that competes with that of the Vedas, wherein bhakti ultimately leads to self-knowledge, liberation (moksha) and bliss. However the Bhagavata Purana asserts that the inner nature and outer form of Krishna is identical to the Vedas and that this is what rescues the world from the forces of evil. An oft-quoted verse is used by some Krishna sects to assert that the text itself is Krishna in literary form. The date of composition is probably between the eighth and the tenth century AD, but may be as early as the 6th century AD. Manuscripts survive in numerous inconsistent versions revised through the 18th century creating various recensions both in the same languages and across different Indian languages. The text consists of twelve books (skandhas) totalling 332 chapters (adhyayas) and between 16,000 and 18,000 verses depending on the recension. The tenth book, with about 4,000 verses, has been the most popular and widely studied. It was the first Purana that was translated into a European language, when a French translation of a Tamil version appeared in 1788 and introduced many Europeans to Hinduism and 18th-century Hindu culture during the colonial era. "Purana" means "ancient, old". Bhagavata means "devoted to, follower of Bhagavat – the "sacred, divine (God, Lord)". An alternative interpretation of Bhagavata is "devotees of the Adorable One". Bhagavata Purana therefore means "Ancient Tales of Followers of the Lord". The composer of this work, Lord Veda Vyasa, in his second verse has described the Subject, Eligibility and the Fruit of studying and named it as Srimad Bhagavatam. Sri is used for wealth or abundance or richness. Such Sri elevates one higher and hence called Srimad. Bhagavata also means Sacred or Divine or Holy. The holy or divine verses brings an abundance of happiness, Devotion, Knowledge that is in Vedas and Vedanta, Dharma, Vairagya to the reader or listener and hence is called Srimad Bhagavatam. The Bhagavata Purana was a significant text in the bhakti movement and the culture of India. Dance and theatre arts such as Kathakali (left), Kuchipudi (middle) and Odissi (right) portray legends from the Purana. The Bhagavata is widely recognized as the best-known and most influential of the Puranas and, along with the Itihasa and other puranas, is sometimes referred to as the "Fifth Veda". It is important in Indian religious literature for its emphasis on the practice of devotion as compared to the more theoretical approach of the Bhagavad Gita; for a definition of religion that competes with the Vedas and for its extended description of a God in human form. It is the source of many popular stories of Krishna's childhood told for centuries on the Indian subcontinent and of legends explaining Hindu festivals such as Holi and Diwali. The Bhagavata declares itself the essence of all the Upanishads and derivative Smritis; In the third verse, Lord Veda Vyasa has described Srimad Bhagavata as Juice of a fruit borne by a tree of Vedas called Kalpavruksha and easy to relish. Here Vedas are like seeds, Brahma Sutra, Bhagavad Gita, Vishnu Sahasaranama is like trunk, branch, leaves, flowers. The fruit and its Juice being Srimad Bhagavata. As Srimad Bhagavata has the substance of Vedas, Vedanta and Mahabarata, it has high significance. The Srimad Bhagavatam is the very essence of all the Vedanta literature. One who has enjoyed the nectar of its rasa never has any desire for anything else. The text has played a significant role in Chaitanya's Krishna-bhakti in Bengal, and in the 15th–16th century Ekasarana Dharma in Assam, a panentheistic tradition whose proponents, Sankardeva and Madhavdeva, acknowledge that their theological positions are rooted in the Bhagavata Purana, purged of doctrines that find no place in Assamese Vaishnavism and adding a monist commentary instead. In northern and western India the Bhagavata Purana has influenced the Hari Bhakti Vilasa and Haveli-style Krishna temples found in Braj region near Mathura-Vrindavan. The text complements the Pancharatra Agama texts of Vaishnavism. While the text focuses on Krishna "Lord Narayana (Vishnu) himself appears and explains how Brahma and Shiva should never be seen as independent and different from him". The sixth book includes the feminine principle as Shakti, or goddess Devi, conceptualizing her as the "energy and creative power" of the masculine yet a manifestation of a sexless Brahman, presented in a language suffused with Hindu monism. The fifth book of the Bhagavata Purana is significant in its inclusion of homage and many chapters of legends about the Tirthankaras of Jainism particularly Rishabha, while homage to Buddha is included in various chapters by declaring him as one of avatars of Vishnu. However, the interpretation of Buddhism-related stories in the Purana range from honor to ambivalence to polemics wherein prophecies predict some will distort and misrepresent the teachings of the Vedas, and attempt to sow confusion. The Bhagavata Purana is also significant in asserting that Yoga practice is a form of Bhakti. The Bhagavata Purana, in verse 2.9.32, asserts its primordial origins. The text and the Hindu tradition also hagiographically credits the authorship of all 18 Maha Puranas to Veda Vyasa, who is revered for authoring the Mahabharata as well, and other ancient classics of India. According to Rai Bahadur Srisa Chandra Vidyarnava vishnu bhagavatam is a modern compilation attributes to bopadeva - the author of Mugdhabodha Vyakaranam. Modern scholarship dates its composition to between 500 CE to 1000 CE, but most likely between 800 and 1000 CE. A version of the text existed no later than 1030 CE, when it is mentioned by al Biruni and quoted by Abhinavagupta. The Bhagavata Purana abounds in references to verses of the Vedas, the primary Upanishads, the Brahma Sutra of Vedanta school of Hindu philosophy, and the Bhagavad Gita, suggesting that it was composed after these texts. The text contains more details of Krishna's biography than the 3rd- 4th-century Harivamsha and Vishnu Purana, and is therefore likely to have been composed after these texts, suggesting a chronological range of 500–1000 CE. Within this range, scholars such as R. C. Hazra date it to the first half of the 6th century CE, Bryant as well as Gupta and Valpey citing epigraphical and archaeological evidence suggest much of the text could be from the 4th to 7th century, while most others place it in the post-Alvar period around the 9th century. Parts of the text use an archaic Vedic flavour of Sanskrit, which may either suggest that its authors sought to preserve or express reverence for the Vedic tradition, or that some text has an earlier origin. There are two flavors of Krishna stories, one of warrior prince and another of romantic lover, the former composed in more archaic Sanskrit and the later in a different linguistic style, suggesting that the texts may not have been composed by one author or over a short period, but rather grew over time as a compilation of accretions from different hands. The Bhagavata Purana contains apparent references to the South Indian Alvar saints and it makes a post factum prophecy of the spread of Vishnu worship in Tamil country (BP XI.5.38–40); these facts, along with its emphasis on "emotional Bhakti to Krishna" and the "Advaita philosophy of Sankara", lead many scholars to trace its origins to South India. However, J. A. B. van Buitenen points out that 10th–11th CE South Indian Vaishnava theologians Yamuna and Ramanuja do not refer to Bhagavata Purana in their writings, and this anomaly must be explained before the geographical origins and dating are regarded as definitive. Since the 19th-century, most scholars believe that the Bhagavata Purana was written by a group of learned Brahmin ascetics, probably in South India, who were well versed in Vedic and ancient Indian literature and influenced by the Alvars. Postmodern scholars have suggested alternate theories. The Puranas are a type of traditional Hindu texts that took form during the medieval period, often both informed by earlier material and undergoing later interpolations. It is therefore problematic to assign a precise date to any Purana text. Modern scholarship on Puranas manuscripts, including those of Bhagavata Purana, has been challenging because there are numerous, inconsistent versions of each Purana. Most editions of Puranas, in use particularly by Western scholars, are "based on one manuscript or on a few manuscripts selected at random", even though divergent manuscripts with the same title exist. Scholars have long acknowledged the existence of Purana manuscripts that "seem to differ much from printed edition", and it is unclear which one is accurate, and whether conclusions drawn from the randomly or cherrypicked printed version were universal over geography or time. This problem is most severe with Purana manuscripts of the same title, including the Bhagavata Purana, that exist in regional languages such as Tamil, Telugu, Bengali and others—which have largely been ignored. The Bhagavata is primarily a bhakti text, with an emphasis on achieving moksha through cultivating a personal relationship with Vishnu in the form of Krishna. [note 1] The philosophy and teachings of the Bhagavata include several traditions, and an absence of a "narrow, sectarian spirit". While Bhakti Yoga is the prominent teaching, various passages show a synthesis that also includes Samkhya, Yoga, Vedanta, and Advaita Vedanta. The Bhagavata is among the most important texts on bhakti, presenting a fully developed teaching on bhakti that originated with the Bhagavad Gita. Bhakti is presented as a path of yoga, or "union with the divine". Many of the bhakti teachings in the Bhagavata are presented as yogic activities—meditating on the lila of Krishna; hearing and singing about Vishnu as Krishna; remembering, serving, and worshiping him; dedicating all of one's actions to him—all are among nine activities of Bhakti Yoga taught in the Bhagavata. While classical yoga attempts to shut down the mind and senses, the Bhakti Yoga in the Bhagavata teaches that the focus of the mind is transformed by filling the mind with thoughts of Krishna. There are many didactic philosophical passages, but the lengthy narrative stories are also a teaching; the book describes one of the activities that lead to liberation (moksha) as listening to, reflecting on the stories of Krishna and sharing their feelings for Krishna with others. Bhakti is depicted in the Purana, states Matchett, as both an overpowering emotion as well as a way of life that is rational and deliberately cultivated. The Purana presents seven teachers and their hagiographic stories—describing for example Kapila, the Samkhya philosopher, as someone who was born as a full grown adult, who teaches his mother that to reach liberation, she must have bhakti, jnana (wisdom), and vairagya (dispassion), with bhakti being the most important. Other teachers such as Narada and Shukadeva described in the Purana, however, present Bhakti with less prominence, and emphasize Advaita philosophy and Jnana yoga instead but then add that adoring Hari (Krishna) has the same liberating benefits. Surendranath Dasgupta describes the theistic Samkhya taught by Kapila in the Bhagavata as the dominant philosophy in the text. In the Bhagavata, Kapila is described as an avatar of Vishnu, born into the house of Kardama in order to share the knowledge of self-realization and liberation. Kapila's Samkhya is taught by him to his mother Devahuti in Book Three, and by Krishna to Uddhava in Book Eleven. Samkhya in the Bhagavata is presented somewhat differently from in other classical Samkhya texts. It describes Brahman, or Bhagavan, as creating all beings within his Self in latent form—then, on its own initiative, bringing itself into Maya and falling " under the influence of its own power". This is in contrast to classical Samkhya, where the impulse for creation is "inherent in primal nature", or prakriti. The treatment of Samkhya in the Bhagavata is changed by the text's emphasis on devotion. In Chapter Eleven, Krishna describes the world as an illusion, and the individual as dreaming, even while in the waking state. He gives Samhkhya and Yoga as the way of overcoming the dream, with the goal of Samhkhya as Bhagavan himself in the aspect of Krishna. The Bhagavata frequently discusses the merging of the individual soul with the Absolute Brahman, or "the return of Brahman into His own true nature", a distinctly advaitic or non-dualistic philosophy of Shankara. The concept of moksha is explained as Ekatva (Oneness) and Sayujya (Absorption, intimate union), wherein one is completely lost in Brahman (Self, Supreme Being, one's true nature). This, states Rukmani, is proclamation of "return of the individual soul to the Absolute and its merging into the Absolute", which is unmistakably advaitic in its trend. In the same passages, the Bhagavata includes a mention of Bhagavan as the object of concentration, thereby preserving its character of being a Bhakti book. Scholars describe this philosophy as built on the foundation of non-dualism speculations in Upanishads, and term it as "Advaitic Theism". The term combines the seemingly contradictory beliefs of a personal God that can be worshiped with a God that is immanent in creation and in one's own self. God in this philosophy is within, is not different from the individual self, states Daniel Sheridan, and transcends the limitations of specificity and temporality. He describes Advaitic Theism as a "both/and" solution for the question of whether God is transcendent or immanent in relation to creation, where God is identical with Self and the Universe, and credits the Bhāgavata with a "truly creative religious moment" for introducing this philosophy. The text suggests that God Vishnu and the soul (Atman) in all beings is one. Bryant states that the monism discussed in Bhagavata Purana is certainly built on the Vedanta foundations, but not exactly the same as the monism of Adi Shankara. The Bhagavata asserts, according to Bryant, that the empirical and the spiritual universe are both metaphysical realities, and manifestations of the same Oneness, just like heat and light are "real but different" manifestations of sunlight. and some love neither, Oh! please explain this to us truly. thus is neither dharmic nor genuinely friendly. who love without being loved in return. In the sociology of the Bhagavata Purana, writes Edwin Bryant, those with malicious and evil intent are first destroyed, but even they are involuntarily liberated because they constantly think of Krishna and devote their life to destroying him. The implicit message thus is, states Bryant, that Krishna is forgiving regardless of "one's past actions and sins", and "anyone and everyone is eligible to engage voluntarily in the process of bhakti yoga and attain the goal of pure devotion, irrespective of caste, social status, race or gender". In several chapters, the text states that the Bhagavata is a means for women to seek spiritual liberation, with some verses suggesting that expressing their sensual desires is one path to such devotion. Some scholars disagree that the Bhagavata Purana was a socially and sexually revolutionary text, states Coleman, rather it may reflect a conservative ideology where women in the form of Gopis amorously chase the divine Krishna who is represented as a man, the liberation of Gopis is actually fleeting despite their praise in the text as the most blessed of devotees for love. Many scholars, however, view the Bhagavata as a remarkably early literary work that questions and discusses social and gender norms in the 5th to 10th-century India. The Bhagavata Purana is "strongly heterodox" in its philosophy, states Sheridan, but this is unlikely to have been because of the last author of presently surviving manuscripts. The language, the theme and the legends are consistently inclusive socially and extravagant in the text, suggesting that all its authors must have accepted this premise, a theme of social equality that is found in the entire Puranas genre of texts. The text teaches bhakti is available and effective for everyone regardless of their gender, caste or race. The Bhagavata also suggests that the poorest can do bhakti, with Krishna saying to Rukmini in chapter 10.60, "we are poor and we are always the favourites of poor persons." The text, in Book 7, describes the legend of a bhagavata (devotee) named Prahlada. He is described as a boy full of virtues, but who is born to a demon king who is persecuting people for their independent and different religious beliefs in favor of Vishnu. Prahlada disagrees with his father, resists him, and pursues what he feels is right. In this legend, and many others, the text challenges presumption and stereotypes about a person based on birth and heredity, as well as encourages the readers through the character of Prahlada to resist threats, harassment and indoctrination from anyone. The Purana, state Gupta and Valpey, implies that virtues and vices are an individual's attributes, and you must see a person who they are, rather than assume they simply follow their parents because of hereditary. The Purana conceptualizes a form of Dharma that competes with that in the Vedas, suggesting that Bhakti ultimately leads to Self-knowledge, Moksha (salvation) and bliss. Before the Bhagavata text, the earliest mention of Bhakti are found in the Shvetashvatara Upanishad verse 6.23, but scholars such as Max Muller state that the word Bhakti appears only once in this Upanishad, that too in one last verse of the epilogue, could have been a later addition, and that the context suggests that it is a panentheistic idea and not theistic. Scholarly consensus sees bhakti as a post-Vedic movement that developed primarily during the Epics and Puranas era of Indian history. The Bhagavata Purana develops the Bhakti concept more elaborately, proposing "worship without ulterior motive and with kind disposition towards all" as Dharma. The text calls it bhagavata-dharma, including in its scope intellectual and emotional devotion as well as Advaita Vedanta ideas. The legends of Bhagavata Purana discuss and describe Dharma through examples. The text does not subscribe, state Gupta and Valpey, to contextless "categorical notions of justice or morality", but suggests that "Dharma depends on context". The text considers the reality of the world divided, continuously challenged by the struggle between good and evil, threatened by some despite better intentions of others. In Chapter 15 of Book 7, the Bhagavata identifies different forms of these destructive, negative and chaotic contexts, naming Upa-dharma (heretical polemics, misrepresentation), Vi-dharma (obstruction, disruption), Abhasa-dharma (semblance, pretension), Chala-dharma (deceit) as examples of Adharma. In a positive or neutral context, states the Bhagavata, ethics and moral behavior must be adhered to; when persistently persecuted by evil, anything that reduces the strength of the "evil and poisonous circumstances" is good. That which is motivated by Bhakti, that which furthers Bhakti, that which enables Bhakti is Dharma in the text – Bhakti is the golden standard of Dharma. The Bhagavata Purana describes all steps of the Yoga practice, characterizes Yoga as Bhakti, states Sharma, asserting that the most important aspect of the Yoga is the spiritual goal. The text dedicates numerous chapters to it, in various books. The 10th chapter of Book 11 begins with a declaration that Siddhi results from concentrating one's mind on Bhagavan Krishna, which thus resonates but substitutes the concept of "personal god" in Yogasutras of Patanjali, yet also contrasts with Patanjali's view where Siddhi is considered powerful but an obstacle to Samadhi and towards the goal of Self-knowledge, inner peace and moksha. Sheridan as well as Pintchman affirm Bryant's view, with the added remark that the Vedantic view emphasized in the Bhagavata is non-dualist described within a reality of plural forms. The Purana includes an introduction in Book 1 that describes its own creation. The Bhagavata describes itself as a recounting of events by the storyteller Ugrasrava Sauti (Sūta) to Shaunaka and other sages assembled in the Naimisha Forest. Sūta asserts, in this preface that Veda Vyasa was feeling unsatisfied, even after he had distilled the knowledge of the Vedas into the Epic Mahabharata. The sage Narada advises Vyasa that his unease was because he had not yet described the highest goal of knowledge. Vyasa thereafter writes the twelve books for the text, and teaches it to his teenage son Shuka. The text describes Shuka as a precocious Advaita Vedantin who, rather than becoming a Krishna devotee, entered sannyasa and renounced the world as a child. Sūta recounts the first recital of Vyasa's work, given by Vyasa's son Shuka to King Parikshit, the grandson of Arjuna, who is dying. After hearing the recital, Parikshit dies. The first nine books are mostly associated with Vishnu and classical form of bhakti-yoga, wherein various ancient tales of bhagavata (devotees of Vishnu) are enumerated. These bhagavata include Prahlad, Gajendra, Dhruva, Bali, Uddhava, Vidura, Maitreya, Parikshit, Priyavrata, Akrura, Ajamila and others. It is the tenth book that unfolds the largest chapter and the masterpiece poetic work of the text, through and on Krishna. The Bhagavata in verse 1.1.3 describes itself as the "ripened fruit of the Vedic tree", as the "essence of all the Vedas and Epic" in verses 1.2.3 and 1.3.42. Many of the legends are interconnected in the Bhagavata. The text asserts that gods (Deva), demons (Asuras) and human beings do things, and behave in good or evil ways, in part, because of their past experiences and their innate evolving natures (Guṇa). The evil behavior of demon king Hiranyakasipu in Book 7, for example, against his own son Prahlada for his Bhakti for Vishnu, is not simply because of demonic Tamasic Guṇa but also because Vishnu in his Varaha avatar had killed Hiranyakasipu's brother Hiranyaksa in Book 2. Hiranyakasipu turned vengeful against Vishnu ever since then, and had refused to consider whether Hiranyaksa deserved to die. The Varaha story in Book 2 is in turn linked to the story of Jaya and Vijaya, who had inadvertently annoyed four child sages in another legend of Book 3. These stories are further linked to legends of Ravana, Kumbhakarna, Sisuphala and Dantavakra elsewhere. Evil has temporal reasons that feeds it, good has spiritual reasons that sustains it, and the cosmic tension between the two, with cycles of conflict, weaves through the chapters in twelve books of the Bhagavata Purana. The underlying metamessage of the text to the devotees of Vishnu, state Gupta and Valpey, is that "one must refuse to see others as enemies, instead understand others, resist the wrong by resorting to a life of spirituality and that reading the text has the power to transform". Vishnu is Atman in each being, manifests Himself in action consciousness and will. Brahma is the propelling power in the involution of beings, which gives them their physical body. Vishnu is the propelling force in the evolution of beings through Prana (life), sensation, intellect and lastly the spiritual faculties. Vidura's pilgrimage to various holy places provides the backdrop for the stories and spiritual teachings in Book 3. Near the Yamuna River Vidura meets Uddhava, who gives him the news of the Kurukshetra War and about Krishna's death in chapter 1 of Book 3 (this is described in greater detail in chapters 30 and 31 of Book 11 as well). Vidura then meets the sage Maitreya, and learns how the world came into being, the divisions of time, and other subjects of cosmology. The story of the birth of Hiranyakasipu and Hiranyaksa is told, including the latter's death at the hands of Varaha, the boar avatar of Vishnu. An important story is the tale of Devahuti and her son Kapila, thus folding in one version of the teachings of the Samkhya school of Hindu philosophy. Kapila's Samkhya teachings help lead her to final liberation. The third book also includes Maitreya's theory on the qualities of Supreme Truth and of the individual self (atman, soul). The story of Daksha and his sacrifice is told, in which he mocks Shiva in front of Dakshayani—his own daughter and Shiva's consort—resulting in Dakshayani's self-immolation, which later came to be known by one of her names, Sati. The legend of Dhruva's penance and devotion to Vishnu is also recounted, along with the related story of king Prithu. The book ends with the recounting of the renunciation and liberation of the Pracetas brothers. This is the story of Manu's sons and their children leads eventually to Bharata and a description of the world, the sun and its course, the moon and the planets, the regions below the earth, and the twenty-eight hells (naraka). In the beginning, I alone existed. There was nothing else as internal or external. I was pure consciousness and unmanifested. There was deep sleep everywhere. A relief at 12th-century Chennakesava Temple, Karnataka depicting the Purana story of Narasimha destroying a demon king who persecutes his subjects and son for their religious beliefs. The main portion of the seventh book is dedicated to the well known story of Hiranyakaśipu, his son Prahlada, and the death of Hiranyakaśipu at the hands of Narasimha, an avatar of Vishnu. This version expands on the story of Prahlada as told in the Vishnu Purana, and is the form that is most commonly told in Hinduism. Prahlada is considered a great devotee of Vishnu, and describes the process of bhakti toward Bhagavan. The sage shaking off the three dream states (waking, dreaming, dreamless sleeping) through understanding himself meditates on the non-duality of thought (bhavadvaitam), the non-duality of action (kriyadvaitam), and the non-duality of substance (dravyadvaitam). The description of the six past Manvantaras (ages or time periods of Manu) and the seven future ages of Manu includes several stories, many involving the avatars of Vishnu. Nine chapters are dedicated to the oft told story of Vishnu's Vamana (dwarf) avatar and his defeat of Bali. The story of the churning of the ocean of milk is also recounted, which is done with the help of the Kurma avatar of Vishnu. The current age of Manu is described at length, including the traditional history of the Solar Dynasty founded by Ikshvaku and the Lunar Dynasty of Pururavas. A long history of dynasties is described—Panchala, Magadha, Kuru, Anu, Druhyus, Turvasu, and others—leading up to the Yadu dynasty and the birth of Krishna to his parents Vasudeva and Devaki. Krishna and the gopis, from a Bhagavata Purana manuscript c. 1760. The tenth book, dedicated to Krishna, is responsible for the widespread popularity of the Bhagavata Purana. Book Ten includes the most enduring images and stories of Krishna: the mischievous child who steals butter; the God as a child who holds the entire universe within himself; the boy who can slay demons and move an entire mountain with one finger; the cowherd who is the love of all the gopis, making them leave all their duties to follow him. The Bhagavata has inspired numerous Vaishnava temples across India. In Assam, these include hundreds of Hindu monasteries named Satra (shown above). These include a hall called Nam Ghar where prayer singing, dancing and village meetings are held. The tenth book is by far the lengthiest, taking up almost one quarter of the entire Bhagavata. 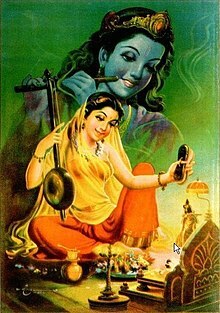 While the Mahabharata and the Bhagavad Gita show Krishna in various roles as teacher and diplomat, book 10 shows Krishna simply engaging in lila, or divine and intimate play with his devotees. It presents this intimate relationship with God as the highest goal of human existence. The Book describes how after a long period of peace and prosperity, carelessness and excesses within the society make people forget self responsibility, and the need to follow or protect dharma. Infighting between good people begins, ultimately leading to the destruction of the Yadava dynasty. The end comes through a senseless but brutal internecine war, described as a drunken fight, which kills all the Yadavas along with Krishna's human form. The last chapter describes Krishna's ascent to Vaikuntha. Book eleven also includes the so-called Uddhava Gita, the last discourse of Krishna, which he addresses to Uddhava. Book 11 section 7-9 discusses the pastimes and realizations of an Avadhuta. The last book of the text includes various prophesies, such as the future rulers of Magadha, along with the evils of Kali Yuga and how Kali Yuga cycle will end with the destruction of the world (pralaya) to give birth to new Yuga cycle. The main story ends with the death of King Parikshit. The book includes a summary of the entire Bhagvata, a standard description of the ten characteristics of a Purana that is found in every Puranic text, three chapters about the life of Markandeya, and the assurance that it is the greatest among puranas. it delights the saintly and the virtuous with the nectar of its many Lila of Hari. it illuminates the One Reality without a second, it is the means of attaining Kaivalya [liberation]. The legendary tales of the Bhagavata Purana have inspired many dance, theatre and festivals in India. Anjum Bharti (above) choreographing in Kathak style, while a group performs Rasa Lila in Manipuri style. The Bhagavata Purana played a key role in the history of Indian theatre, music and dance, particularly through the tradition of Ras and Leela. These are dramatic enactments about Krishna's childhood, teenage and adult life. The themes range from his innocent frolics as a child, to his expressing his confusion and doubts about approaching girls, to him wooing and romancing gopis (girls in the cow herding community) who meet him secretly thus getting in trouble with their parents, to his intimacy with beloved Radha, to his playing flute while saving the world from all sorts of troubles and thus preserving the dharma. Some of the text's legends have inspired secondary theatre literature such as the eroticism in Gita Govinda. While Indian dance and music theatre traces its origins to the ancient Sama Veda and Natyasastra texts, the Bhagavata Purana and other Krishna-related texts such as Harivamsa and Vishnu have inspired numerous choreographic themes. Many Ras plays dramatise episodes related in the Rasa Panchadhyayi ("Five chapters of the Celestial Dance"; Book 10, chapters 29–33) of Bhagavatam. The purana accords a metaphysical significance to the performances and treats them as religious ritual, fusing the daily life with spiritual meaning, thus representing a good honest happy life or Krishna-inspired drama depicting the same as a form of cleansing the hearts of faithful actors and listeners. The Bhagavata Purana grants the singing and dancing and performance of any part of it, as an act of remembering the dharma in the text, as a form of para bhakti (supreme devotion) towards the Lord. To remember Krishna at any time and in any art, asserts the text, is to worship the good and the divine. Bhagavatam also encouraged theatrical performance as a means to propagate the faith (BP 11.11.23 and 36, 11.27.35 and 44, etc. ), and this led to the emergence of several theatrical forms centred on Krishna all across India. The Bhagavata ranks as an outstanding product of Sanskrit literature. Perhaps more significantly, the Bhagavata has inspired more derivative literature, poetry, drama, dance, theatre and art than any other text in the history of Sanskrit literature, with the possible exception of the Ramayana. The stories in the Bhagavata Purana are also the legends quoted by one generation to the next, in Vaishnavism, during annual festivals such as Holi and Diwali. The Bhagavata Purana is one of the most commented texts in Indian literature. Over eighty medieval era Bhasya (scholarly reviews and commentaries) in Sanskrit alone are known, and many more commentaries exist in various Indian languages. The oldest exegetical commentary presently known is Tantra-Bhagavata from the Pancaratra school. From the modern age there is the commentary by Madhvacharya (c. 13th century CE) titled Bhagavata Tatparya Nirnaya, then later Sridhara Swami's Sridhariyam written in the 15th century CE. Other commentaries are: Hanumad-Bhasya, Vasana-bhasya, Sambandhoki, Vidvat-kamadhenu, Tattva-dipika, Paramahamsa-priya, Suka-hridaya. Vopadeva wrote the Mukta-phala and the Hari-lilamrita. Vijayadhvaja composed the Pada-ratnavali. Viraraghava also edited The Bhāgavata-Candrika (from Ramanuja's school). Other works are the Subodhini by Vallabha and Bhakti-ratnavali by Visnupuri. Among the Gaudiya Vaishnava commentaries there are Jiva Goswami's Tattva-sandarbha (16th century CE), the Sarartha Darsini by Vishvanatha Chakravarti (17th century), the Dipikadipani by Radharamana, Bhaktisiddhanta Saraswati's Gaudiya-bhasya (20th century). A. C. Bhaktivedanta Swami Prabhupada has written a multi-volume edition that includes English translation and commentary of striking Purports, which has been translated in more than 40 languages. The Tattva Sandarbha commentary of the 16th-century Vaishnava scholar Jiva Goswami analyzes the text, with the remark that the Bhagavata is written in a popular story style, which is easy to read and simpler to understand, than other important ancient Indian philosophical literature. The text is a Cakravartin (sovereign) of all Puranas, states Goswami, not only because of its poetic excellence, simple language and direct style, but also because it "contains the essential meaning of all the Vedas, Itihasas and other Puranas, because it rests on the Brahma Sutras, and because it is complete". A Telugu version was rendered by the poet Pothana in the 15th century Andhra Maha Bhagavatam.It is considered as "the crown jewel of Telugu literature". The transcreated work, known as the Bhagavata of Sankaradeva, is the primary theological source for Mahapurushiya Dharma in the Indian state of Assam. Sankaradeva (1449-1568 CE) drew inspiration chiefly from the Bhagavata and he himself undertook the task of rendering of the major portion, namely Books I, II, III, VI, VII, VIII, IX, X, XI and XII. Besides the rendering, he composed a large number of works with materials from the Bhagavata such as the Kirttana Ghosha, which is an anthology (kavya-kosh) of more than two dozen epics of various magnitudes. Most of the poems of the Kirttana are renderings or adaptations from the Bhagavata Purana. His Nimi Nava Siddha Samvada is a doctrinal treatise based on Book XI of the Bhagavata. His Anadi Patana is mainly an adaptation from Book III of the Bhagavata. The Gunamala, the 'Garland of Praises (for Lord Krishna)' written by Sankaradeva is a little handbook capturing in racy, rhyming and sonorous verses, the essence of the Bhagavata Purana. Within the compass of a single laudatory verse, the poet recounts many incidents from Krishna's life making them easy to remember. This 'pocket-Bhagavata' is a sacred text for all Assamese Vaisnavas and is often placed in the pedestal or the Guru-Asana (sacred throne) in the congregational prayer-house called Namghar as the object of veneration. A condensed Srimad Bhagavatam in Sanskrit, the Narayaneeyam, was composed by Melpathur Bhattathiri of Kerala in 1586. The 16th-century Saint Eknath of Paithan- Maharashtra wrote a scholarly commentary on the 11th Book of the Shrimad Bhagavatam named "Ekanathi Bhagavata" in Marathi, the vernacular language of the Indian state of Maharashtra. The first translation of the Bhagavata into French was made by a Jesuite educated Indian Maridas Poullé in 1769. Another French translation was done by Eugene Burnouf in 1840. A. C. Bhaktivedanta Swami Prabhupada has written a multi-volume edition that includes English translation and commentary, which has been translated in more than 40 languages. Swami Tapasyananda has written an English translation in four volumes. Swami Prabhavananda wrote an English version that is part translation, part summary and paraphrase, titled The Wisdom of God: Srimat Bhagavatam. Asthan Vidwan Motaganahalli Ramashesha Sastri was the first person to translate Bhagavata Purana into Kannada. For this translation, a detailed foreword replete with historical references was given by renowned Indian historian S. Srikanta Sastri. Gita Press has a two-volume English and Hindi translation (with Sanskrit text and English translation). Gita Press also has published the Oriya translation, Srimadbhagavata Mahapurana, of Åtivadi Jagannatha Dasha, which is regarded as the oldest Indian vernacular translation from Sanskrit. However, this is debatable since the exact dates of other competing translations of Pothana in Telugu and Shankaradeva in Asamese are not documented, although these translators were contemporaries of Jagannatha Dasha. Kamala Subramanian has written a concise version of this book in English. Another translation of Book X was published on Writers Workshop in 1997, transcreated by Nandini Nopani and P. Lal. Edwin Bryant published an English translation of Book X in 2004, through Penguin Books. ^ Krishna, states Daniel Sheridan, subsumes the identities of Vishnu, Narayana, Purusha, Ishvara, Hari, Vasudeva, Janardana and others. ^ Prem Lata (1989). Chaitanya Mahaprabhu. Ess Ess Publications. p. 7. ISBN 9788170001003. ^ Robert Van Voorst (2007). Anthology of World Scriptures. p. 28. ISBN 978-1111810740. ^ Gopal, Madan (1990). K.S. Gautam, ed. India through the ages. Publication Division, Ministry of Information and Broadcasting, Government of India. p. 76. ^ Chatterji, Suniti Kumar. "The Eka-sarana Dharma of Sankaradeva: The Greatest Expression of Assamese Spiritual Outlook" (PDF). Retrieved 29 October 2012. ^ SN Sarma (1966), The Neo-Vaisnavite Movement and the Satra Institution of Assam, Gauhati University, ISBN 978-8173310263, page 27, Quote: "the Chapters of the Bhagavata Purana, where the Pancharatra theology is discussed, have been omitted by Assamese translators"
^ TS Rukmani (1993), Researches in Indian and Buddhist Philosophy (Editor: RK Sharma), Motilal Barnarsidass, ISBN 978-8120809949, pages 217-224, Quote (page 218): "The Bhagavata emphasizes yoga as bhakti and it is in the method of realization of its spiritual goal that yoga becomes important". ^ a b Sheridan 1986, p. 53. ^ Karen Pechilis Prentiss (2014), The Embodiment of Bhakti, Oxford University Press, ISBN 978-0195351903, page 17, Quote: "Scholarly consensus today tends to view bhakti as a post-Vedic development that took place primarily in the watershed years of the epics and Puranas." ^ Beck 1993, pp. 107-108. ^ "The Bhagavata of Sankaradeva; Assamese rendering of the Bhagavata Purana". atributetosankaradeva. 2008-10-02. Retrieved 2012-12-26. ^ "The Holy Kirttana". atributetosankaradeva. 2012-03-29. Retrieved 2012-12-26. ^ "Gunamala" (PDF). atributetosankaradeva. 2008-04-16. Retrieved 2012-12-26. Beach, Milo Cleveland (1965). "A Bhāgavata Purāṇa from the Punjab Hills and related paintings". Bulletin of the Museum of Fine Arts. 63 (333): 168–177. JSTOR 4171436. Beck, Guy (1993). Sonic theology: Hinduism and sacred sound. University of South Carolina Press. pp. 183–184. ISBN 978-0-253-35334-4. Brown, Cheever Mackenzie (1998). The Devī Gītā: the song of the Goddess ; a translation, annotation, and commentary. SUNY Press. ISBN 978-0-7914-3940-1. Dasgupta, Surendranath (1949). A history of Indian philosophy. IV: Indian pluralism. Cambridge University Press. Datta, Amaresh (2006). The Encyclopaedia Of Indian Literature. vol. 1. Sahitya Akademi. ISBN 978-81-260-1803-1. Haberman, David L.; Rūpagōsvāmī (2003). Indira Gandhi National Centre for the Arts, ed. The Bhaktirasāmṛtasindhu of Rūpa Gosvāmīn. Motilal Banarsidass Publ. ISBN 978-81-208-1861-3. Jarow, Rick (2003). Tales for the dying: the death narrative of the Bhāgavata-Purāṇa. SUNY Press. ISBN 978-0-7914-5609-5. Matchett, Freda (1993). "The Pervasiveness of Bhakti in the Bhāgavata Purāṇa". In Werner, Karel. Love Divine: Studies in Bhakti and Devotional Mysticism. Routledge. pp. 95–116. ISBN 978-0-7007-0235-0. Matchett, Freda (2003). "The Purāṇas". In Flood, Gavin D. The Blackwell companion to Hinduism. Wiley-Blackwell. pp. 129–144. ISBN 978-0-631-21535-6. Rocher, Ludo (1986). The Puranas. Wiesbaden : Harrassowitz. pp. 138–151. ISBN 978-3-447-02522-5. Rukmani, T. S. (1993). "Siddhis in the Bhāgavata Purāṇa and in the Yogasutras of Patanjali – a Comparison". In Wayman, Alex. Researches in Indian and Buddhist philosophy: essays in honour of Professor Alex Wayman. Motilal Banarsidass. pp. 217–226. ISBN 978-81-208-0994-9.
van Buitenen, J. A. B (1996). "The Archaism of the Bhāgavata Purāṇa". In S.S Shashi. Encyclopedia Indica. New Delhi: Anmol Publications. pp. 28–45. ISBN 978-81-7041-859-7.